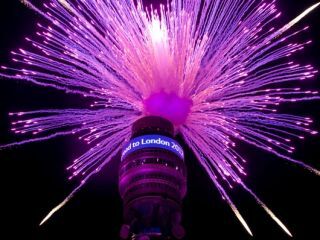 The BT Tower has been given a large-scale makeover, with the London landmark playing host to a massive 360 degree LED array. The display is said to be the largest seen in Europe and Asia – measuring over 280 square metres, with a circumference of 59 metres – and has been erected to celebrate the fact that there's just 1,000 days to go before the capital plays host to the 2012 Olympics. For stat fans, the display is being lit up by 529,750 LEDs over 177 panels which equates to a whopping 177,000 pixels. Speaking about the installation, Sir Michael Rake, BT Chairman, said: "As one of the most iconic and well-known landmarks in London, it's only fitting that the BT Tower is used to generate pride and excitement among Londoners today – 1,000 days to the start of the London 2012 Olympic Games. "We're extremely proud that the Tower will be playing such an essential role in informing and engaging people across the capital." In keeping with the Olympics theme, it was a 'marathon' effort installing the display, which weighs around 3.6 tonnes. According to BT it took 2,700 separate trips in the lift to transport materials to the top of the tower, over seven miles of scaffolding and 2.5 miles of power, lighting and electrical cables to power the thing. And there were a total of 114 construction workers and engineers who worked on the project – food for thought the next time you look up at the display, which will reside between the BT Tower's 36 and 37th floors until the Olympics take place. To see the display for yourself, check out the YouTube video below or log on to www.btplc.com/BTLondon2012.